Ask.com may advertise that they have “The Algorithm,” but Google doesn’t even need to advertise. It always seems to find what you’re looking for in a neat, organized and efficient way, and while I sometimes find myself trying out other engines such as Snap.com, I always end up coming back to Google. There are a lot of resources out there explaining what it is, so I wont really go into it. If you want to learn more, Google it. I do, however want to point out three Greasemonkey scripts that compliment eachother and customize the Google interface to be much more productive. 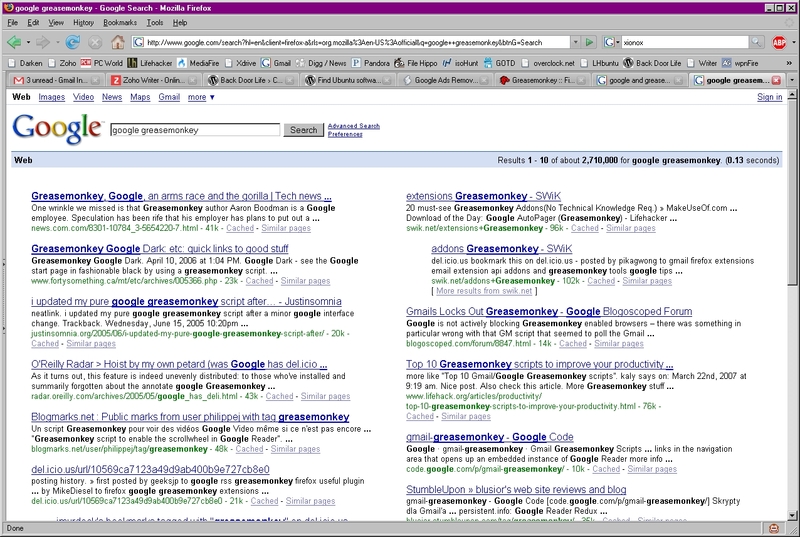 The next makes use of that extra space by wrapping around the second half of your search results into another column. there are two scripts that do this depending on how you like it, one is the more popular Two Column Google which comes as regular and in a row-wise version. 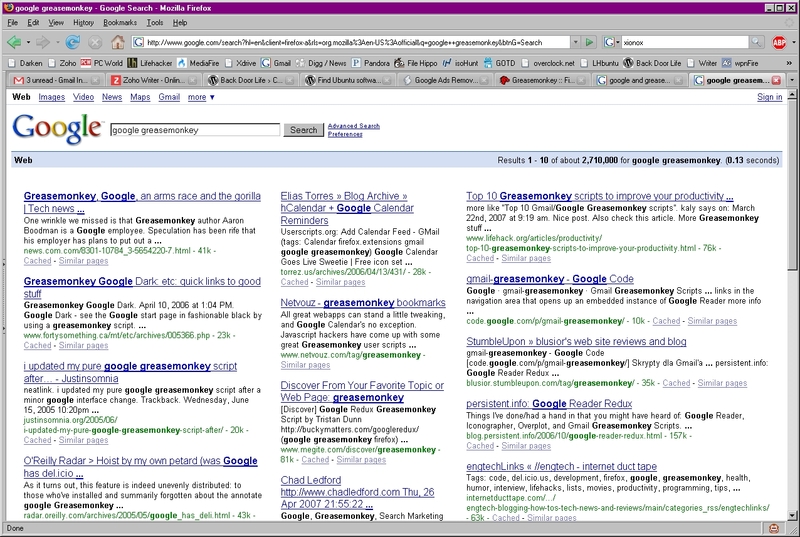 The second one, which I like better, is called Multi-Column View of Google Search Results. It isn’t Row-wise, but it allows you to switch the number of columns up to 3 by using a keyboard shorcut of alt+1, 2, or 3. The final script autoloads the next page of search results as you scroll down, so you’ll never have to click the “next” button again. 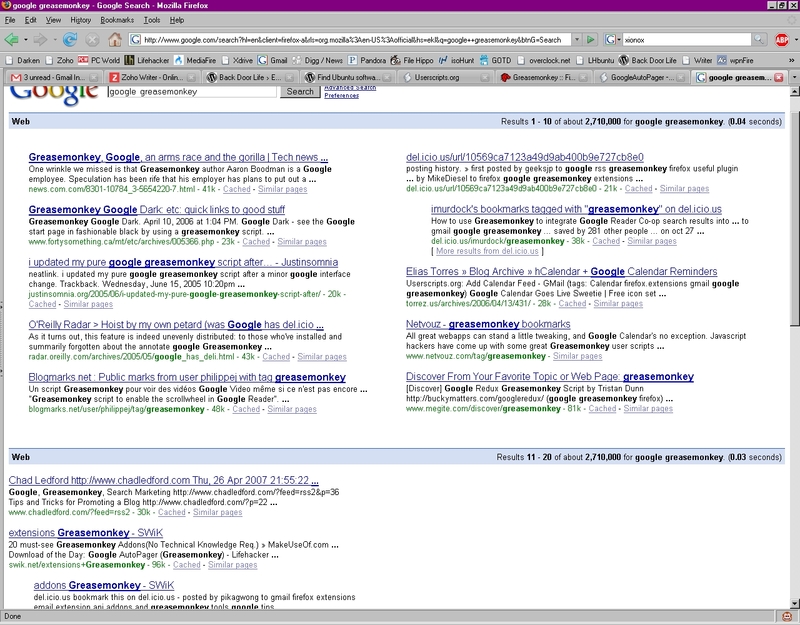 It also have an advantage over setting the number of results per page to 100 as it is faster. It is called GoogleAutoPager. The downside is that the two column scripts only work on the first page of results, but that doesn’t really hinder its usability. Congratulations! Google is even more useful!